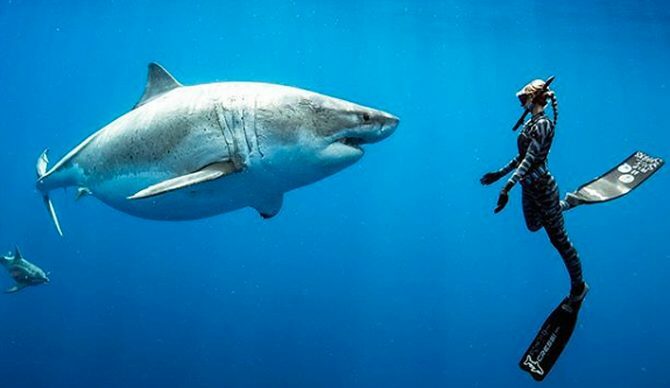 We’ve all been watching Ocean Ramsey and a handful of other watermen and women swim with the ocean’s top predator for years. But the image of any human floating freely next to a great white — scratch that, possibly the largest great white ever recorded — will never be anything short of amazing. Earlier this week, the diving community around Hawaii stirred itself into a bit of a frenzy. A shark by the name of Deep Blue had been spotted feeding on a whale carcass near Oahu. On one hand, great white sightings are rare around Hawaii, to begin with. And Deep Blue sightings are even rarer; the last time anybody had seen her reportedly was three years ago and more than 2,000 miles away off of Mexico’s Guadalupe Island. And why would everybody be excited about this particular great white? Apparently, the 50-year old shark is the largest ever recorded at 20-feet long and weighing more than two and a half tons. The shark is so popular she even has more than 10k Twitter followers. On Tuesday, Ramsey and her fiance, Juan Oliphant, came across a shark that either is Deep Blue herself, or another shark nearly the same size and with similar markings. So they did exactly what you’d expect them to do. According to at least one expert, this wasn’t Deep Blue. “We have the pictures in our database and confirmed that the shark that was seen Sunday is Deep Blue, but the one she dove with is not,” says Martin Graf, who has access to the Guadalupe Island photo-identification database and runs an expedition company which specializes in trips there.